Lamborghini has officially re-entered the SUV sector, as their brand new, high-performance Urus SUV looks ready to slay any and all opponents in its segment. According to Lamborghini, the Urus' 4.0-liter twin turbo V8 engine will help it fit in perfectly alongside the Aventador and the Huracan, and based on sheer numbers alone, it's easy to understand why. With 641 HP (650 PS) and 627 lb-ft (850 Nm) of torque at its disposal, the Lamborghini Urus is able to hit 62 mph (100 km/h) in 3.6 seconds, 124 mph (200 km/h) in 12.8 seconds, and a top speed of 190 mph (305 km/h). A plug-in hybrid option will be available later on. The power hits all four wheels with the help of an electro-hydraulically controlled 8-speed automatic transmission, while a torque converter goes on to boost the twin-turbo V8's response. The torque split on the four-wheel drive system is 40/60, with a maximum 70% of torque reaching the front wheels on demand, or as much as 87% going to the rear. 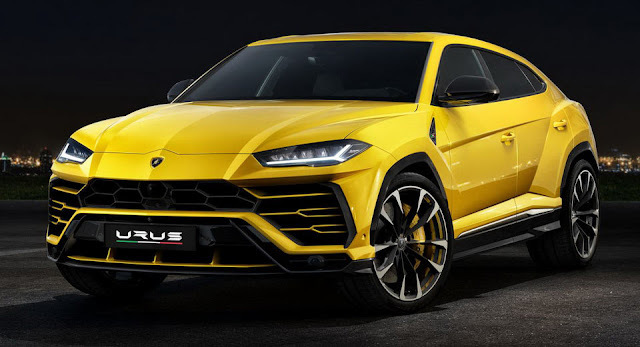 Speaking of which, the Urus borrowed the Aventador S' rear-wheel steering system, set to utilize counter-phase steering at low speed and in-phase steering and high speed - the former aiding maneuverability, the latter stability. Also, in order to achieve a performance-oriented center of gravity, Lamborghini mounted the Urus' turbocharged engine low, while also placing the central turbocharger near the combustion chambers, thus enhancing engine response. Once you get the Urus moving, you can choose between its six drive mods: Strada, Sport, Corsa, Neve (snow), Terra (off-road) and Sabbia (sand), plus a custom mode called Ego. Neve, Terra, and Sabbia will all raise the chassis of the car in order to improve ground clearance, while Strada, Sport, and Corsa will optimize performance for the street and for various levels of sporty driving. 0 Response to "Lamborghini Launches Urus Super SUV, Gives It 641HP To Play With"